Throughout life, the female body biologically progresses through various reproductive stages until it eventually transitions out of fertility. On a monthly basis, estrogen is one of the most important hormones in regulating the menstrual cycle, pregnancy, and more. Accordingly, with the natural cessation of ovarian estrogen production comes the menopausal transition as hormone levels fall. 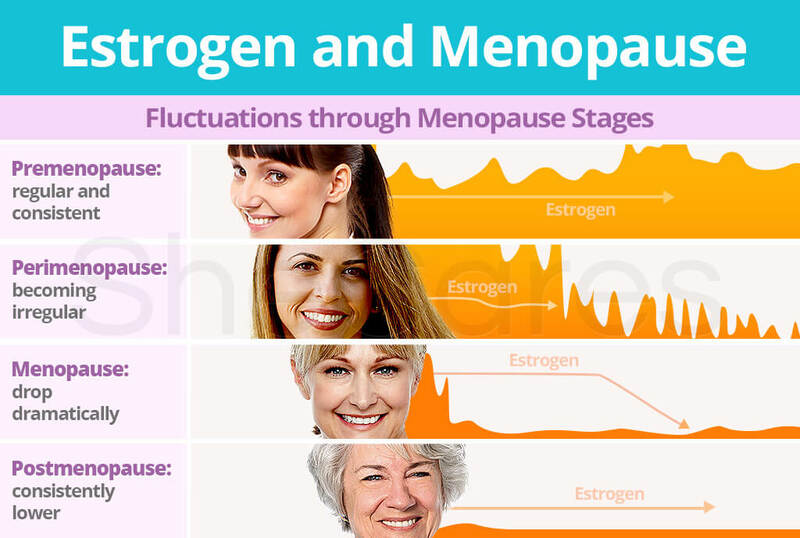 Continue reading to learn more about the fluctuations of estrogen across the menopausal stages and the myriad of symptoms hence provoked, from hot flashes and mood swings to hair loss and incontinence. Although premenopause and perimenopause are used interchangeably, premenopause can be considered the first stage that begins with menarche and ends with the initiation of perimenopause. It is during this time that a woman is in prime reproductive years as natural fluctuations of estrogen guide each menstrual cycle. Certain diseases and lifestyle factors may throw off hormonal balance and cause irregularities. Perimenopause usually occurs two to eight years before the onset of menopause. It begins with irregular menstrual cycles and ends a year after the last menstrual cycle. Nevertheless, it is possible for women to experience symptoms as early as their mid-30s. Although there is a continuous, natural decline in ovarian estrogen production, high levels of estrogen can evolve as the body compensates for the drop in progesterone production as well. On average, the North American woman will reach natural menopause around age 51. 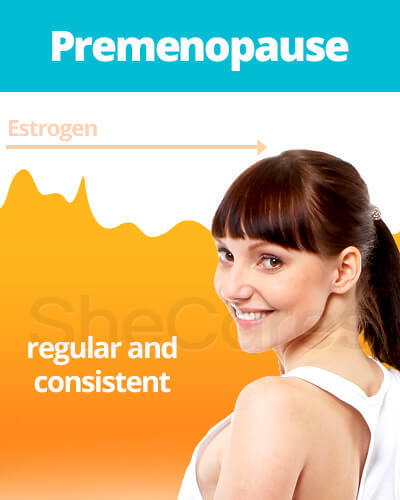 However, as aforementioned, the beginning of the menopausal transition can occur earlier, causing a woman to reach menopause at a younger age. Menopause is defined as a point in time when a woman has gone 12 consecutive months without a menstrual period. 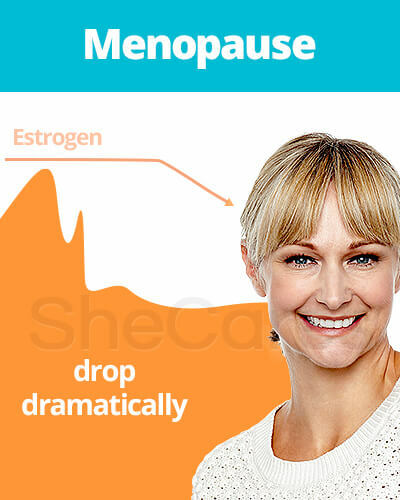 At this time, estrogen levels have been decreasing and fluctuating until menstruation stops. 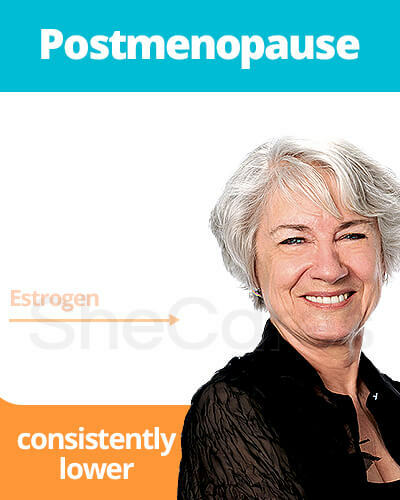 After menopause, a woman is considered postmenopausal. For decades prior, the ovaries have produced the majority of the body's estradiol. During postmenopause, blood estrogen levels drop dramatically, and much of women's estrogen is derived from converting androgens to estrogen in body fat. This lack of circulating estrogen triggers a new range of health risks aside from already burdening symptoms. These health risks from postmenopausal estrogen levels include osteoporosis and cardiovascular disease. Estrogen levels can become extremely unbalanced throughout the various stages of menopause. These hormonal fluctuations can cause numerous signs and symptoms, which can mistakenly resemble other conditions. Understanding the importance of estrogen during and after reproductive years is a crucial step toward helping women go through the transition more consciously. Nevertheless, having low estrogen levels or high estrogen levels brings about its own list of distinct signs and symptoms that can throw a woman's body into calamity. 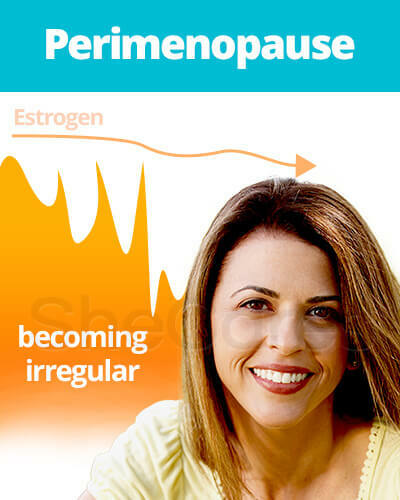 To discover more about healthy estrogen levels, click on the preceding link. Does Low Estrogen Cause Menopause Symptoms?